Europa is sixth closest of the 79 moons orbiting the incredible gas giant Jupiter but it is also the most exciting one. The moon, sometimes known Jupiter II, is a hopeful candidate for alien life thanks to a vast an unexplored ocean world beneath its icy surface. According to NASA, Europa only measures one-fourth the diameter of Earth but is estimated to hold twice as much water as all of the Earth’s oceans combined. With a bit of luck, these subterranean waters could be home to extraterrestrial microbes and NASA’s Europa Clipper plans to hunt them down. The Europa Clipper is an interplanetary orbiter, currently under construction, which could launch towards Jupiter as early as 2023. Dubbed after a 19th century class of sailing ships, the Clipper space probe will enter orbit around the icy moon for close flybys. The Clipper’s primary mission is to perform 40 to 45 flybys, involving surface investigations and high-resolution imaging of the Moon. Robert Pappalardo, a Europa Clipper project scientist at NASA, said: “During each orbit, the spacecraft spends only a short time within the challenging radiation environment near Europa. READ MORE: NASA confirms METHANE in Martian atmosphere but could it be proof of life? The ultimate end goal of the ambitious mission is for NASA to determine whether Europa’s salty ocean world is habitable. 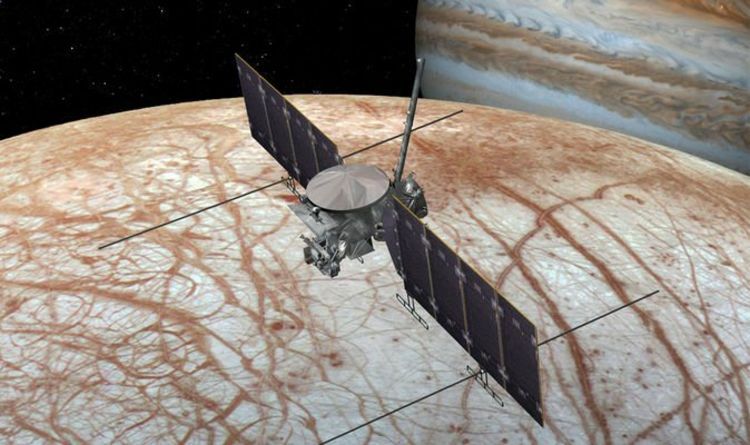 The Clipper will need to discover whether Europa’s liquid water, chemical ingredients and internal energy sources are enough to trigger the spark of life. NASA said: “Life as we know it seems to have three main requirements: liquid water, the appropriate chemical elements, and an energy source. “Europa seems to have abundant water and the right chemical elements, but an energy source on Europa has been difficult to confirm. “On Earth, life forms have been found thriving near subterranean volcanoes, deep-sea vents and other extreme environments. The most likely form of life, which could develop on Europa, is basic microbial biology. If NASA can prove the existence of alien life developing on two separate worlds around the same star, the potential for life in other parts of the universe will skyrocket. On April 1, NASA unveiled the powerful high-gain antenna, which will transmit data from the Europa Clipper back to Earth. The communications tool measures around 10ft (3.04m) in height and will beam to Earth all photos of the icy moon. NASA said: “Tests on this prototype antenna are scheduled to wrap up soon; however, researchers plan to return to the Experimental Test Range in 2020 to conduct acceptance tests on Europa Clipper's high-gain antenna flight article.